This article deals with INVALID, OPTION OFF status of Oracle database components AMD, ORDIM, JAVAVM, CATJAVA and XOQ after upgrade to 12c using a full RMAN backup. 1. Overview of Oracle components and their status. After upgrade to 12.1.0.2, the Oracle database components Oracle Multimedia (ORDIM), JServer java VM (JAVAVM), Oracle database Java (CATJAV) and Oracle OLAP API (XOQ) have the status INVALID and also the component OLAP Catalog has the status OPTION OFF. 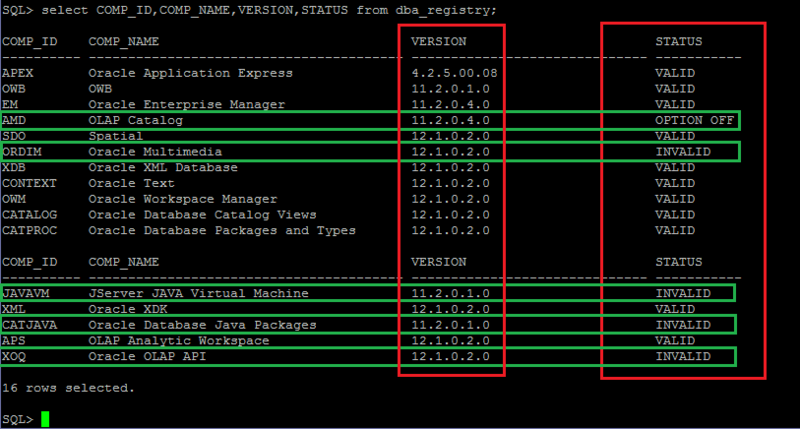 Note: Starting with Oracle Database 12c, Oracle XML DB is a mandatory component of Oracle Database. You cannot uninstall Oracle XML DB, and there is no option to exclude it when you create an Oracle database. Note: DBA_REGISTRY displays information about all components in the database that are loaded into the component registry. The component registry tracks components that can be separately loaded into the Oracle Database. This component is desupported with Oracle database 12c. After upgrade from 11.2.0.4, this component is already exist with the status OPTION OFF. To remove it, then just execute the catnoamd.sql script before or after upgrade. Note : This step has been updated by Maciej Tokar!! Note: Restart the database to ensure the error is resolved. compiler: Standard Java compiler. When the CREATE JAVA SOURCE statement is run, it translates Java source files into architecture-neutral. interpreter: To run Java programs, Oracle JVM includes a standard Java2 bytecode interpreter. The interpreter and the associated Java run-time system run standard Java class files. The run-time system supports native methods and call-in and call-out from the host environment. Note: I think these packages are useful after all, then I am going to remove them and to re-install them again. Note: If you want just to remove the JVM and you don’t want to install the JVM, then delete the JVM-Related objects to datapump (expdp). Oracle interMedia (“interMedia”) is a feature that enables Oracle Database to store, manage, and retrieve images, audio, video, … Oracle interMedia extends Oracle Database reliability, availability, and data management to multimedia content in traditional, Internet, electronic commerce, and media-rich applications. Note: I guess this component is useful, so I am going to re-enable it. Run the script as SYS, located in the $ORACLE_HOME/ord/im/admin/initimj.sql, that will reload those classes. Note: For these reasons, I will remove this component by using the emremove.sql script. This article describes the steps to change the Oracle database components AMD, ORDIM, JAVAVM, CATJAVA, XOQ and EM status.